Discuss and recognize cancer facts, types, 2 stages, 5 risk factors, and multiple causes. Recognize how diet and physical activity can play a role in all aspects of cancer. Discuss 5 treatments used in the cancer process. Describe the role exercise plays in prevention, progression, and rehabilitation of cancer. Describe 13 exercise contraindications and 6 special considerations for clients with cancer. 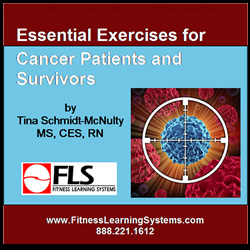 Recognize safe and effective basic exercise guidelines for cardiorespiratory, resistance, and flexibility training for clients with cancer or recovering from cancer. Describe safe and effective basic resistance training exercises for 5 basic muscle groups with varying levels to be used for clients in various stages of the cancer process and recommendations for flexibility exercises.